Tucked away in the Howard Thurman Center for Common Ground, students sit upon assorted couches, clutch coffee mugs, chat with each other and flip through various textbooks. Unknown to them, they are not sitting in just a study room but are, in fact, surrounded by an aquarium frozen in time. Nedret Andre is the artist behind the colorful perspectives of sea life that cover the walls of the Howard Thurman Center. Her exhibit, “Becoming Ocean,” was part of the Boston Turkish Festival — one of the largest of its kind in the United States. The purpose of the festival is to showcase the richness and diversity of Turkish culture. 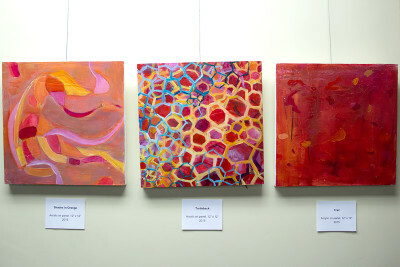 This year’s theme is “Colors of Anatolia,” and Andre’s works certainly do not fall short. “Color, mark making and patterns play an important role in my paintings,” Andre said. The show’s theme is a collection of pastel geometric patterns, flowing blue kelp forests and several daintily painted fish swimming throughout. The exhibit is comprised of dozens of individual and multi-paneled sets of semi-abstract depictions of aquatic life, all inspired by sea grass. This statistic is adequately mirrored in Andre’s works, for a majority of them contain discernable amounts of aquatic life. Many of Andre’s works are abstract and free form, but a cohesive color palette unifies the diversity and complexity of patterns and geometric shapes. Reds, blues, oranges and teals show up across the collection and legitimize each piece’s relationship to the other. Even though not every work depicts aquatic life, the freeform style of these paintings keeps the exhibit consistent. “Her paintings invite the viewers to project their experiences into this fusion of real and imagined landscapes,” said Peter Galeno, a professor at Newbury College’s School of Arts and Design. “Becoming Ocean” does just that. Without a particular message or image, Andre’s paintings allow the viewer to take away a more personal meaning. One of Andre’s largest pieces in the exhibit measures approximately 40 inches by 30 inches in size, and is more concrete and realistic than some of her others. It depicts a blue seaweed forest on the ocean floor with several small fish swimming in and out of the frame. As the viewer steps into the viewpoint of one of the fish, they are truly able to experience the ocean. Another dominant piece Andre displayed is a tryptic of three canvases totaling over six feet in length. Titled “Future Farming,” this trio evokes thoughts of agriculture and bucolic farmland. The colors, coupled with varying patterns of the same pallet, resemble the patchwork and grid-like spread of agricultural fields. “[Her work] reflects the multi-cultural diversity of her background. [It] is a fusion of many elements: recognizable landscapes, Eastern imagery and Western painterly style,” Galeno said. This element of the exhibit resonates with viewers even after leaving the exhibition. Brandon Warnes, a junior in the College of Arts and Sciences, said he was stuck by the works displayed at the exhibit. Ultimately, Andre said her goal is to continue to impact viewers after they leave. She said she wants her collection to inspire a greater cause — environmental preservation.